Fig. 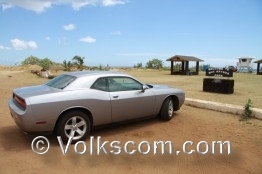 : Driving to the beaches at the Westcoast of Kauai with a Dodge Challenger. 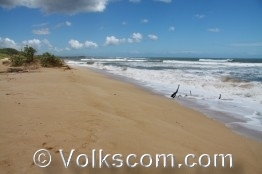 Beaches at the Westcoast of Kauai. The Mac Arthur Beach Park is located in the southwest of Kauai, next to the Kaumualii Highway (Hawaii State Route 50). The beach is small and rather narrow. 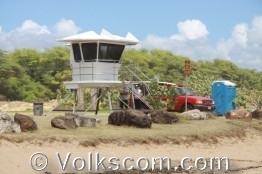 Lifeguards, showers, restrroms, grills and tables are provided at the Mac Arthur Beach in Kauai. Parking space is limited at this beach. No entrance fee and no parking fee is charged at the Mac Arthur Beach Park (as at: August 2011). 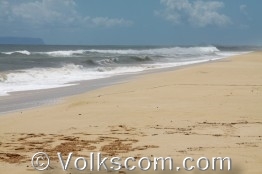 The beach at the Polihale Beach ist an approximately 7 miles long leveled sandy beach. The beach is located at the southern end of the Na Pali Coast. Warning signs warn about the strong currents and the dangerous shorebreak. The road to the Polihale Beach is in a pretty bad condition. A high clearence vehicle (e.g. a SUV) is recomended. Rental cars are normaly not allowed at the road to the Polihale Beach (check your rental agreement first). Restrooms and showers are provided at this beach. No entrance fee and no parking fee is charged at the Polihale State Park (as at: August 2011).